At last count, that is. And Idaho Fish and Game officials in Boise get to tally up the hunting and trapping license revenue, cause that’s how the agency’s budget gets its m0ney (mostly). Meantime, the increasingly muddied ecosystems which gray wolves patrol (regardless of political boundary lines) struggle on. The human propensity for killing carnivores is alive and well. The first near-extinction of Canis lupus didn’t teach enough. Sadly, I know for certain that are conservationists in the Adirondacks who continue to advocate for the return of big predators to that still-mostly-wild region. This link offers a snapshot of the wolf-killing ongoing in Idaho. I have been a wilderness activist for more than 30 years. It is this essential character of wilderness that the supporters of HR 4089 seek to destroy. We have to stop them. Please send a letter today and please help us spread the word. It may well be the most important letter you will ever write on behalf of Wilderness. Thank you. – George Nickas, Executive Director, Wilderness Watch. HR 4089 would give hunting, fishing, shooting, and fish and wildlife management top priority in Wilderness, rather than protecting the wilderness character and wilderness values, as is currently the case. This bill would allow endless, extensive habitat manipulations in Wilderness under the guise of “wildlife conservation” or for providing hunting, fishing, and recreational shooting experiences. It would allow the construction of roads to facilitate such uses, and would allow the construction of dams, buildings, or other structures within Wildernesses. My friend Dave Foreman – a wilderness warrior of long standing, has the whole sordid tale posted on the Web site of The Rewilding Institute, of which he is director. Read it here. 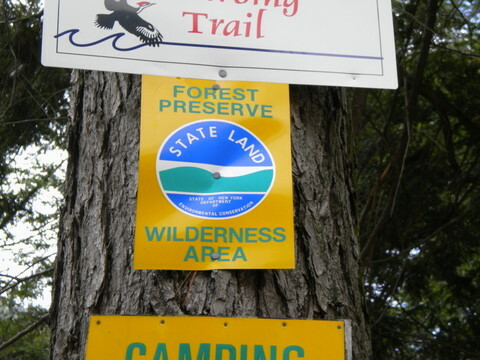 If you’re in the Adirondacks of New York State, you can visit state-designated wilderness like that behind this Department of Environmental Conservation placard a dozen or so miles from the Olympic village of Lake Placid. That’s right, New York State has a state-level wilderness protection program. As far as I now it is the only state to have its own such program. Most designated wilderness (and every acre is just so important) in the U.S. was so designated by Congress through the Wilderness Act of 1964. The more wilderness, the better. Be sure and turn your speakers on before opening this video link. Great show.